I’m going to tell you a little secret…..I’m a cowgirl at heart!!! Seriously, no kidding! And these short cowboy boots are perhaps the most worn of all the cowboy boots I’ve ever had! 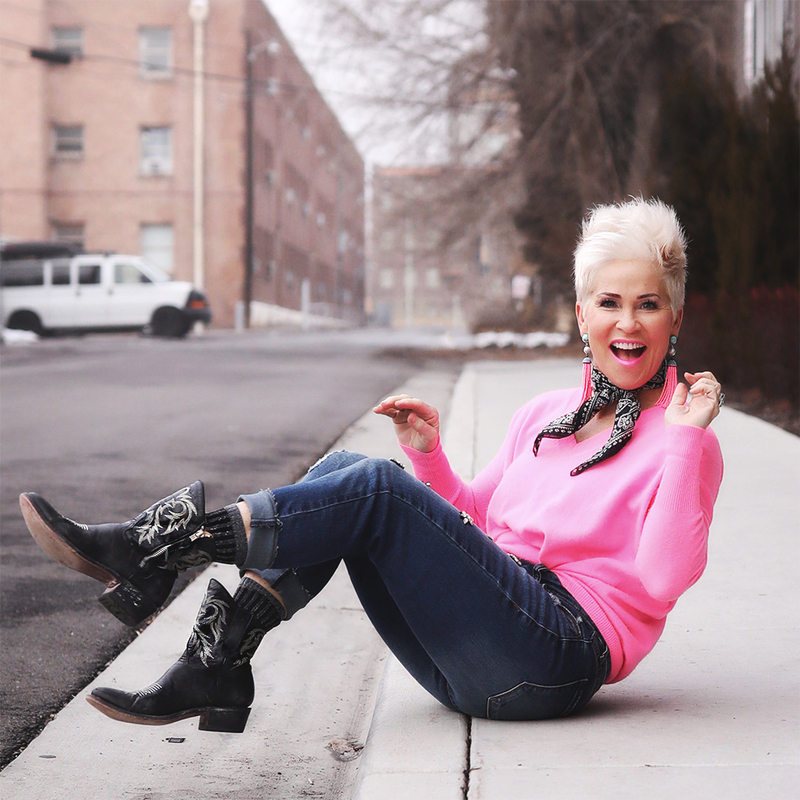 And to modernize my “cowgirl” style, I’ve added a hot pink sweater and a neck scarf! And the embellished jeans are SO DANG CUTE (back in stock and linked below)!!! Oh, and always some FUN earrings! I lived in Arizona for a long time as we raised our family there for the most part. While I was there, I fell in love with the whole vibe of this sort of western look! Cowboy boots, fringe, leather jackets, turquoise, and of course cowboy hats!!! It’s probably not the most fashionable look right now, but do you think you can still make it fit in with what’s going on out there in the FASHION WORLD? I believe you can!!! I think you can take these cowboy boots and pair them with something else more on trend, and look just fine. Some of you don’t care about trends and wear what you want, and that’s all good! In fact I think it’s great when we can feel good about whatever it is we choose to put on that day. But for me….I like to be more up-to-date. What do you all think? Do you agree or disagree? These boots are also so cute with a maxi dress or skirt! A little hippie-like…a bit bohemian! You can shop this look here, with a few things that are “similar”! Don’t miss out on these FUN jeans! LOVE them! I live in Illinois and own 2 pairs of cowgirl boots, every time I wear them someone compliments me on them. I must say I LOVE your boots Shauna! I have a pair of red cowboy boots that I love. Your shorter style boot with the zipper is great! Where did you find the ones you have on? I don’t see the link for the darling jeans? Bought the jean and love them. Thank you for all of your ideas. You are starting to bring out the wild in me at 57:).